Two worlds collide at the Lyric Hammersmith this Christmas. 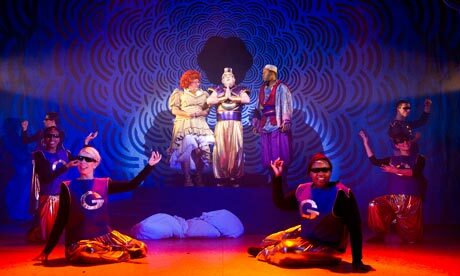 Aladdin is an X Factor style mash-up of street hip-hop and traditional panto. It’s a rocky union but eventually, just like the Princess, you’ll be won over. Initially Steve Marmion, Morgan Lloyd Malcolm and Joel Horwood let the street vibe take over. Hip-hop stereotypes are thrust into our faces with a ferociousness that is dizzying and at times confusing. Aladdin, instead of appearing as a maverick hero, is presented as a gormless ‘youf’ and the cast push their attitudes uncomfortably hard. But as this production flies into the second act the story picks up. Songs like “You Can’t Wish That” are panto gold and the magic carpet is a piece of stage trickery which will delight adults and children alike. Incongruities that irritated before (why does the Emperor keep coming on with an array of different stuffed animals?) are forgotten as the narrative unpacks at a pace and the cast settles into the rhythm of this hybrid piece. The Panto Young Company are a trusty chorus, bounding about Tom Scutt’s swirling bubble-gum set with energy and verve, whilst Philip Gladwell’s florescent, psychedelic lighting almost steals the show. Vocally the cast are fantastic with Sophia Nomvete particularly impressive as the explosive Ringo, the disgruntled ‘Voice of the Universe’. Steven Webb as Wishy Washy, the monkey that speaks in ‘text message’ (like LOLZ! ), treads the thin line between innocence and cynicism charmingly and maybe it’s just that I’ve always gone for the bad guy but Simon Kunz as Abanazer is a thing of evil and a joy forever, more than deserving every ecstatic boo that he gets.